It’s that time of year, and I figure my dozens of loyal readers of this blog deserve a gift as compensation for your pain and suffering. Before you get it, however, please indulge me as I provide a little background. Several months ago – 188 days ago, to be precise – I took the advice of many of you and put a bunch of my songs on iTunes and other online music stores. I created an album, titled it Stalker Tunes, gave it a weird, altered-Yul-face cover, and then uploaded a bunch of my demo tracks and waited for the money to roll in. I figured I should at least get enough to cover expenses, as it cost me $50 at tunecore.com to get my album online. I figured there were somebody might be interested, or maybe there were some weirdos who download goofy songs from albums that have Yul Brynner’s face on them. To date, I’ve made 81 cents. My song “I Am a Cow” has sold one copy on iTunes, and it’s streamed 14 times on Spotify, and I get a penny per stream. (Inexplicably, it seems especially popular in Great Britain, where one p is worth 1.5 cents!) My song “Avalon” has streamed once; “Bad Lovin’” has streamed once, and “Bright Yellow Can (The Mustard Song)” has streamed twice. 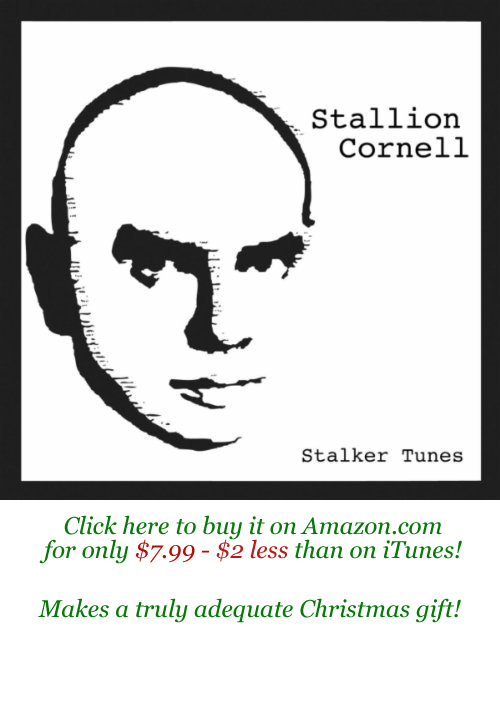 So, given my unparalleled success as a musician, you should be intensely grateful for what I’m about to give you: free Stallion Cornell, Christmas-themed music! Huzzah! You may have heard this tune via this blog or Facebook, but I’ve finally recorded a more professional version, which chronicles this story which has been told and retold numerous times. I keep waiting for Hollywood to come calling for the movie rights, but alas, it has not happened. Yet. Your very own .mp3 of The Miracle of the Christmas Poo, free of charge. We’re trying to send out Christmas cards/thank yous to everyone who was so supportive after our oldest daughter’s skiing accident this year. If you’d like a card, please send me a message at stallioncornell@yahoo.com with your address. Below is the letter that the lovely Mrs. Cornell wrote to accompany the cards. I’ve been putting off sending thank you notes to all the many, many people that I need to send them to because I kept hoping to plan a big shebang that I could invite everyone to as a thank you. However, it’s now December and I haven’t done it, so I’m going to kill at least a couple of birds with one stone. I’m still going to plan that big shebang, so be looking for that invitation. But until that happens…Thank you! Thank you to all of you that sent cards, drawings, emails, texts (I did get them all. I was just too overwhelmed to respond), cookies, candy, games, comfy socks, knitted hats, blankets, books, movies, letters, etc. Thank you to all of you who called Cleta and other members of our family (again, I did listen to the messages and was grateful for them). Thank you to everyone who supported the kids at my house by bringing in meals (it was very fun when a delivery car showed up with pizza ordered from California), taking them to practices, taking over my carpools, and just watching out for them. Thank you to all who came to the fundraiser. Thank you to a wonderful friend who organized that fundraiser. Thank you to all of Cleta’s friends and their parents who brought them up to the hospital. Thank you to all of our adult friends who also came up to the hospital. Thank you to the kind souls that waited with us during Cleta’s 5-hour surgery. Thank you to our wonderful neighbors who outdid themselves redoing Cleta’s bedroom (and Chloe’s) as a welcome home surprise. Thank you to the men who donated their time to make our home accessible to Cleta. Thank you to two wonderful Grandmas who dropped everything in their lives to take up residence here. And thank you to everyone who said a prayer for Cleta or for our family. They were felt. So instead of listing the highlights of our year, I figured I’d list the top 5 lessons learned this year. 1. Obamacare isn’t all that bad. We just got our insurance renewal and it only went up by $50 a month. We immediately told our kids they could stop eating shoe leather. 2. Don’t wait until you’re rich to start giving generously to charities. Those charities hold the keys to the miracles that many people are waiting for. 3. Thank goodness for TLC (the TV network, that is). Cake Boss and Say Yes to the Dress can get you through a lot of long hospital nights. 4. Never let your kids, spouse, parents (and any other straggler that lives with you) leave the house without telling them you love them. 6. And never let a year go by without letting all the wonderful, magnificent, almost perfect people in your life know how much they mean to you. We love you all and wish you the very best during this Christmas season and 2012. Another Mormon’s Take: Go Newt! Orson Scott Card still considers himself a Democrat. Nobody else does, but there you are. Regardless of what his party affiliation may be, he’s a stupendous writer who generally makes a whole lot of sense, and he’s also an active Latter-Day Saint besides. He’s written an opus on the same subject I did last time, and he recognizes the same things I did – namely, Newt produced solid results in the ’90s, and Mitt’s Mormonism makes him unelectable, even in comparison to Newt’s plethora of baggage. However, he reaches a vastly different conclusion: this is a good thing, and we ought to vote for Newt. [I]f you Republicans actually want to get rid of Obama, stop looking at “true conservatives” — they won’t get the votes of independents and swing Democrats like me. And don’t nominate Romney, either — he’s too fragile and, being a Mormon, too easy to tear down and destroy. The Left will be so glad to do it. Interesting. Although it overlooks the reality that Newt will never be president. His baggage may be more tolerable to the evangelical base than Romney’s Mormonism, but said baggage still makes Newt unelectable in November. The Republicans should win this one in a walk, and and yet they’re very, very close to throwing the whole thing away. It seems we don’t have anybody on the bench that can prevent four more years of Barack Obama, a good man who has proven to be the biggest failure of any president I’ve seen in my lifetime. The moral of the story: politics blows.